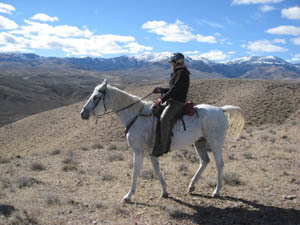 We plan that here at the Owyhee Riding Spa, you see. 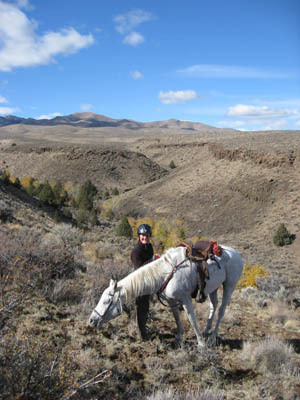 Take you out on a couple of brutal cold windy rainy stormy days, on a rather rough horse, then the last day give you a taste of Owyhee heaven: smoother, very sure-footed horse, perfect sunny fall day and great company. It was indeed perfect today, the kind of day that makes your insides melt like butter: frost in the morning, bright sunshine, snow plastering the near mountains, bright fall colors, pleasantly cool for riding later in the morning. Today we put Tamara on Mac, and Connie rode her beloved Finneas one last time (well - last time this visit. She said "Oh I'll be back! Like maybe next week!") I rode my pal Jose Viola, and Carol rode her mare Justy. We'd planned to make our way up Pickett Creek Canyon again, catch this one road out further up the canyon, make a loop around onto Bates Creek road, and maybe up into the foothills of the mountains a little. Well. Things don't always go as planned. We squirmed our way up the beautiful canyon - the trees getting brighter yellow up there now - and missed that road out of the creek. Carol thought she saw it after we passed it, up on the opposite hillside, but I kept insisting there was another road further up canyon. 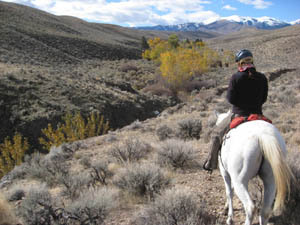 So, we pushed on, finding some cow trails, or blazing our own trails through sagebrush which got taller and wider. The creekbed was too overgrown so we had to stay above it as we got deeper into the canyon, and the walls got a bit closer and steeper. There were still cow tracks - they are still making their way down out of the mountains for winter - so I kept thinking there HAD to be a way through. We passed 2 spots where the tiny trail narrowed to one-hoof-wide size, and had a bit of a steep drop-off. In fact, when Jose's right leg slid off the trail and down before he caught himself on the first one, I cringed, and for the next one I about closed my eyes when he slipped on that one too. I didn't say anything to Tamara ahead of me, but that made me nervous. Later Connie, who was riding behind me, said the same thing! I wasn't worried about Tamara though because she was on Mac, who is the sure-footed-est horse we have. We finally reached a spot where we got stopped by a steep, rocky hillside, too tall and convoluted sagebrush, choked creekbed, and too steep a climb out of the creekbed up the other side. We had to turn around. I did NOT want to re-cross that narrow strip that we had been over, and neither did Connie. Carol suggested just climbing up the steep, rocky hillside behind us. OK with me, I just wanted to get out of this canyon now. It was steep enough for us to get off our horses, and so we led them up on foot, having to sidehill back and forth for much of it. Finneas was stumbling all over the place, and once Connie fell, and he almost slipped on top of her. Not because he was nervous, but because he kept trying to eat everything along the way and he wasn't paying attention! We huffed and puffed and gasped our way to the top of the canyon. By then we were peeling clothes off and even the horses were sweating. Gretchen and I refer to this kind of riding/exploring/evacuating as Bushwhacking (last time we did that in Bridgeport, Spice almost drowned in a bog). Carol said "That's called Going Western, girls!" We decided to abandon the original plan - we could have done the Pickett Canyon loop backwards - and instead continue back towards home but do a big detour down to Hart Creek and the old Homestead. That turned out to be just as terrifically beautiful, and, since we were doing the trail backwards from what I've always done it, for me it was like a totally new trail. I saw things I'd never noticed before, including an old wall structure at the Homestead, and new Badlands cliffs, and the Oreana Savannah cabin tucked away up Hart Creek, where the owner was working away. "Hi!" we hollered. "Great day, isn't it?" "Fabulous!" 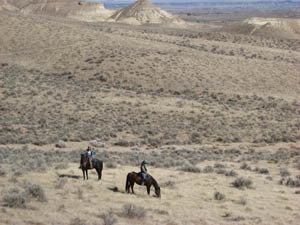 Indeed it was, this 5-hour trail ride in the Owhyee Canyonlands. 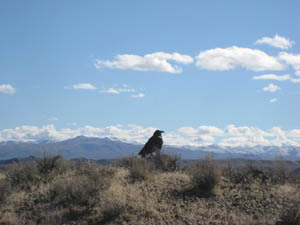 On our last mile home, Hoss the Raven sat on a little sagebrush on top of a little hill 20 feet away from us and watched us ride by, dispensing his good Raven Karma. 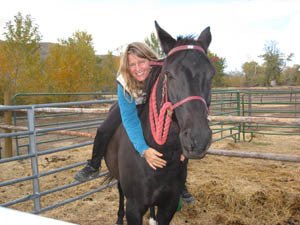 At the Owyhee Riding Spa, we treat you right: horses to fall in love with, dogs to sleep with; good Raven Karma from Hoss, and we take you on some good therapeutic rides. 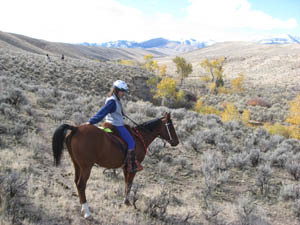 You take home Owyhee-forever memories and (perhaps, like Tamara) days of sore muscles as souvenirs. But it's a good hurt.